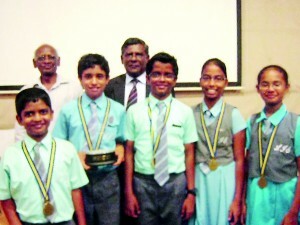 Lyceum Wattala’s scrabblers performed exceptionally in the Under 15 category of the Inter-School Scrabble Championship, organized by Royal College, Colombo, winning all five rounds with a margin of 4402. The tournament saw the participation of nineteen teams. The Lyceum Wattala team consisted of Thavalakshman Yoganathan, Migara Jayasinghe (Captain), Lambhotharan Yoganathan (Vice Captain), Nusrath Sariffo’deen and Hayati Rassool with the adjudicator Kandhan Mahendran, Treasurer of the Sri Lanka Scrabble League and the Chief Guest Wimal Fernando, President of the Sri Lanka Scrabble League.